Swiss lace front Lace hair wig is a high quality German Lace Base wig. It’s soft & breathable and invisible. The material of swiss lace front Lace Hair wigs is suitable for all kind of skin complexions. It is a higher quality product. It is well-thought-out as the most invisible lace material in the market. swiss lace front lace hair wigs can hold medium & light density at the most for short hair. For low volume hair, we prefer light density or even less. If your hair density is heavy, than you can use this. We also supply weightless hair patches and wigs on our wig shop. The invisible Knot Hair System gives it extrudability, less hair pull over, and a longer bond. 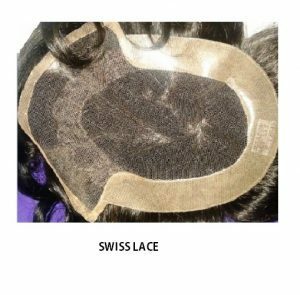 We are offering different variety of swiss lace and hair patches. Super Fine Swiss Lace Hair Wigs is the thinnest and lightest of all bases, excellent hair quality at very low price. swiss lace front hair wigs is invisible on the scalp and gives the most natural looking hairline. Super Fine Swiss Lace is normally preferred for weathered wearers, as per their requirements. For more durability, you may wish to wear French Lace or French Lace with Super Fine Swiss Lace front. Super Fine or Ultra Thin Swiss lace wig would be the best version of Swiss lace available. It is more bleached than the Swiss lace and is readily available for our customers. You can buy from our wig shop at a very reasonable price. Click Here For A Handy Look . Swiss Lace.